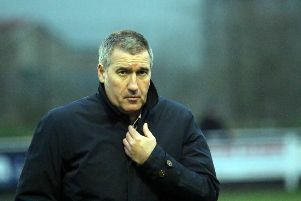 Banbury United boss Mike Ford says his team urgently needs a couple of victories to make sure they don’t get dragged down to the lower reaches of the Evo-Stik League South table. The Puritans slipped to their third straight premier division central defeat in Saturday’s 2-1 reverse against St Ives Town. That ended United’s impressive home record and they are now only seven points off the relegation zone going into Tuesday’s rearranged game with Redditch United at the Banbury Plant Hire Community Stadium. Ford told Puritans Radio: “My message to the players is not to let this season drift away, we’ve worked very hard over the last few years to get this football club back to this level. We must not take our eyes off our league position, I’ve been looking over my shoulder for a few weeks now and we need a couple of wins quickly. “It’s not about ability but there is a lack of confidence at the moment. The four-point deduction followed by two away defeats has knocked the stuffing out of us. The players looked very deflated when the first goal went in against St Ives.